Faux Apple Pie recipe - there are no apples in this pie, but it tastes EXACTLY like an apple pie!! The secret is Ritz Crackers!! Who knew?!?!? Pie crust, Ritz crackers, lemon juice, sugar, cream of tartar, water and cinnamon. Top with crushed crackers, brown sugar, cinnamon and butter. Everyone says this is the BEST apple pie they ever eaten - no-one ever knows it is a cracker pie. 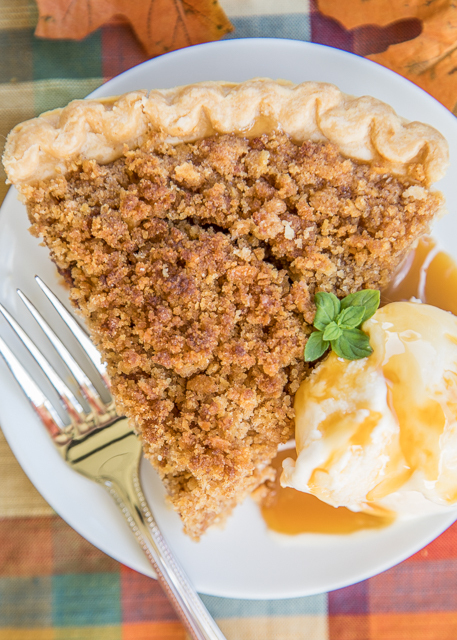 Serve with vanilla ice cream and a drizzle of caramel. Make it for the holidays! 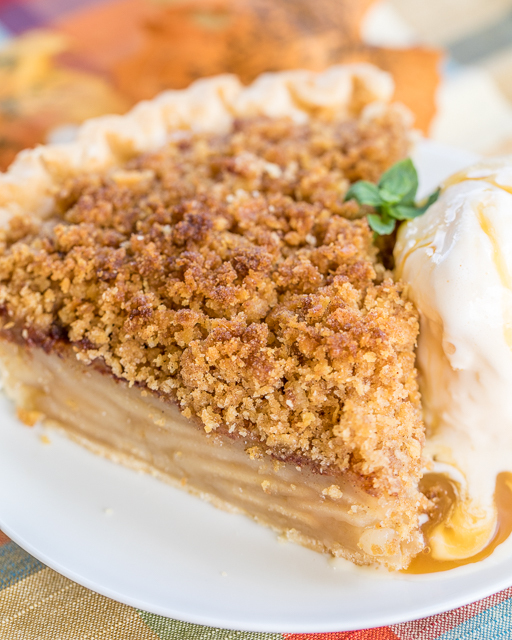 This Faux Apple Pie is CRAZY! 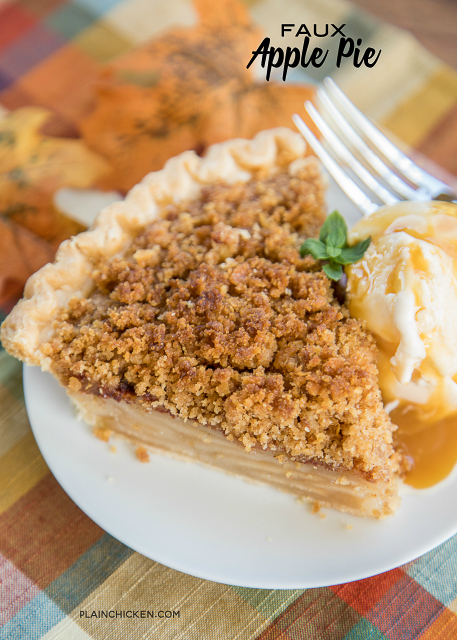 There are no apples in this pie, but it tastes EXACTLY like apple pie!! SO, what is in the pie if it isn't apples? Ritz Crackers. I know!?!?! My Mom told me about this recipe years ago, and I finally decided to make last week. Let me tell you, this is SO good. Chicken Legs tried a slice of this Faux Apple Pie and was shocked at how good it was. I had to tell him that the pie didn't have any apples in it. The original recipe comes from the back of a box of Ritz Crackers. The recipe has been around since the 1930's. If a recipe has been around that long, it must be good! 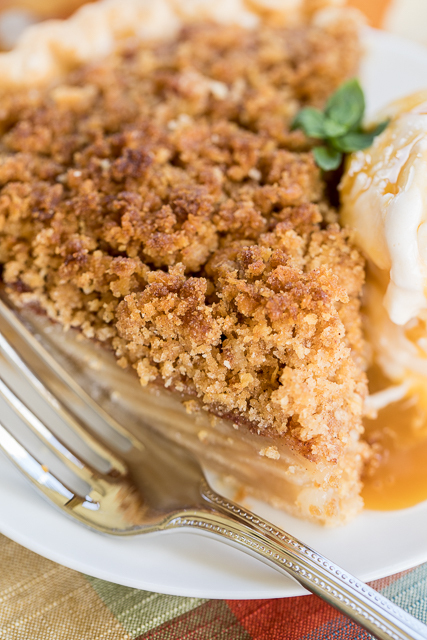 I topped this Faux Apple Pie with buttery cracker crumbs. 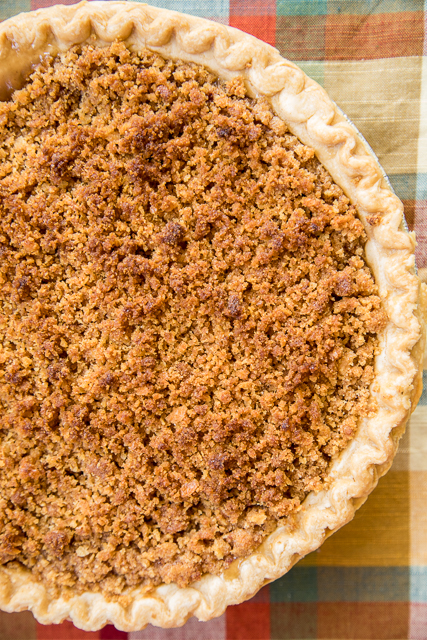 If you don't want to use cracker crumbs, you could leave it plain or top it with another pie crust. We served this Faux Apple Pie with a big scoop of vanilla ice cream and a drizzle of caramel sauce. YUM! Give this a try for your holiday meal. I promise no-one will ever know that there aren't any apples in the pie. Mix together topping ingredients; sprinkle over pie filling. Bake 10 minutes at 400ºF, reduce to 350ºF and cover edges of pie crust with foil. Bake 18-20 more minutes, or until pie filling has set. It shouldn't jiggle a lot when moved. Cool before serving. My mom used to make this when I was a kid. It is so weird how it tastes like apple pie. The texture is a little different but it is still really good. Thanks for the flashback memories of the 70s lol. Let me know what you think. We thought it tasted just like an apple pie! Grew up with this recipe Steph! It was in a booklet sent out by the local electric company! That was in the early 60's! Can't wait to try it again using your recipe! Am baking this now. I can't believe there are no apples. I'll let you know what my guinea pig says.